I've been following this tutorial to get a cel-shader working in Unity 5 along with the standard shaders (explained in the last third of the article). 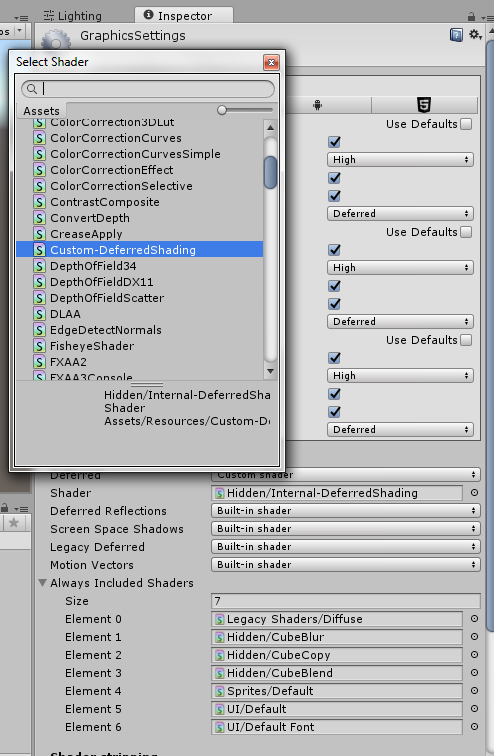 My issue is that when I got to replacing the built-in deferred shader, Unity seems to ignore it! I've been trying really hard to get it to work but it simply seems to be either ignoring my modified shader, which is actually just the default deferred shader with a small change in how the ndotl is calculated. // Pass 2: Final decode pass. Does anyone have an idea why this isn't working? I've even tried replacing the if/else that sets the ndotl to always 0 or always 1 but it almost seems like Unity is ignoring that line altogether, or something is overriding it later down the line and I'm not sure what. 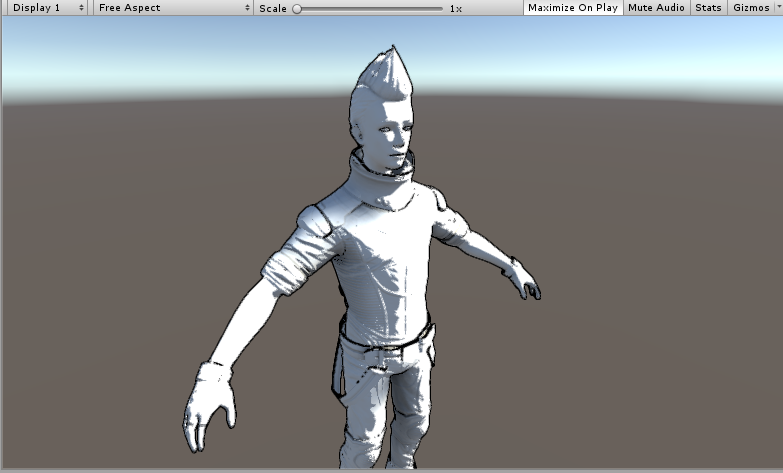 Other than these modifications, the Unity Project only contains a handful of standard assets. Add #define UNITY_BRDF_PBS BRDF2_Unity_PBS right before #pragma's and #define's in the shader. Finding the solution was time-consuming, but I gained useful knowledge and so will you if you follow my “investigation log” below. I hope it's suitable answer format in this case. Now we know that it's not shader that is ignored, but a light.ndotl specifically. UNITY_BRDF_PBS() is pretty much the only possible suspect, because light.ndotl is used only there out of all code in the function after light.ndotl initialization. No choice left other than remove the no longer useful light.ndotl and explore UNITY_BRDF_PBS() definition. 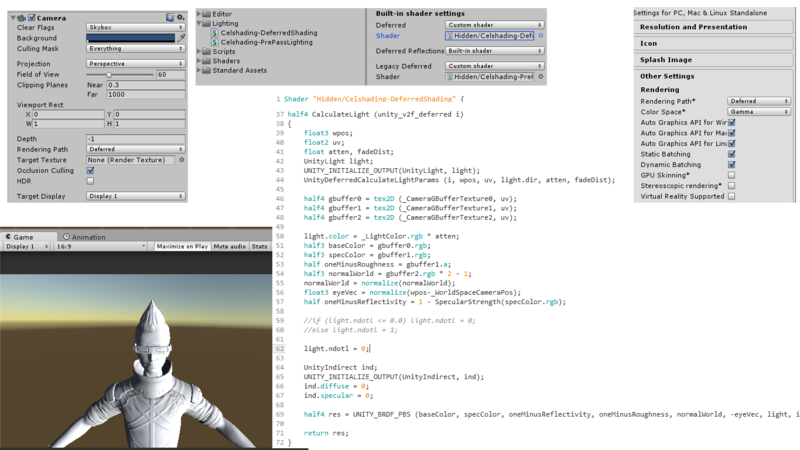 Let's find UNITY_BRDF_PBS in the files that are #included into our shader. It's clear that real work is done by one of BRDFn_Unity_PBS() functions. We should start by finding the best one. // In this case we will modify the normal so it become valid and not cause weird artifact (other game try to clamp or abs the NdotV to prevent this trouble). // The amount we shift the normal toward the view vector is define by the dot product. // A re-normalization should be apply here but as the shift is small we don't do it to save ALU. // As we have modify the normal we need to recalculate the dot product nl. This comment looks suspicious. Everything suggests that this function blatantly ignores the light.ndotl value. // otherwise, it mimics the definition from UnityPBSLighting.cginc. Note that some of the functions used here have been deprecated in Unity 5.5, but I have tested it to work. In Unity 5.5, many changes have been made. The most significant, being that the dot product is now calculated on the fly, and the light.ndotl field is no longer taken into consideration anywhere in code. I spoke to the original author of the blog David Leon and he mentioned that using the LambertTerm function with a slight modification, in the standard BRDF instead of the dot product would help. Based on that input, these are the steps I followed to get the shader working. The LambertTerm function has been moved to the Deprecated section of code, so we make the change in the UnityDepcreatedEX.cginc file. Remove all code in the UnityDeprecatedEX.cginc file and replace with this. Remove all content of the UnityStandardBRDFCustom file and replace with the following custom implementation of BRDF_1_Unity_PBS method. Basically what I've done to the method is renamed it to BRDF_CUSTOM_Unity_PBS and replaced the calculation of nl with the custom LambertTerm function. // In this case normal should be modified to become valid (i.e facing camera) and not cause weird artifacts. // but this operation adds few ALU and users may not want it. Alternative is to simply take the abs of NdotV (less correct but works too). // Following define allow to control this. Set it to 0 if ALU is critical on your platform. // Edit: Disable this code by default for now as it is not compatible with two sided lighting used in SpeedTree. // The amount we shift the normal toward the view vector is defined by the dot product. // A re-normalization should be applied here but as the shift is small we don't do it to save ALU. // To provide true Lambert lighting, we need to be able to kill specular completely. Key things to note on the shader implementation. We override the definition of the UNITY_BRDF_PBS macro with the customized function we implemented in the UnityStandardBRDFCustom.cginc (Be sure to do this right after CGPROGRAM and before the pragmas). Secondly, since we override the UNITY_BRDF_PBS function completely, we no longer need a reference to the UnityPBSLighting.cginc. Therefore it's commented out. We use both UnityStandardBRDF and UnityStandardBRDFCustom cginc files in the shader declared in the mentioned order respectively. Go to Edit->Project Settings-> Graphics and update the Deffered shader to your custom shader. Make sure that your camera's rendering path is set to deffered. Not the answer you're looking for? Browse other questions tagged unity deferred-rendering or ask your own question. Is Deferred Rendering The Future? Can Entities Have Their Own Shader In Deferred Rendering? What is actually done by the deferred rendering pipeline in this context?